Per capita incomes in emerging market and developing economies are expected to grow by about 2 percentage points faster per year than advanced economies between 2017 and 2022. The implication is that the gap in income levels between the two groups of countries is narrowing. However, a closer look at per capita incomes by country paints a different and more nuanced picture. As our Chart of the Week from the October 2017 World Economic Outlook shows, the projected income per capita growth figures mask significant differences—both across and within subgroups of emerging and developing countries. Our outlook projects per capita income in emerging and developing countries to pick up from 3.2 this year to 3.6 percent in 2022. These projections, however, are heavily influenced by growth in the two largest economies – China and India. Both countries account for almost 50 percent of the emerging market and developing economies’ real GDP in purchasing power parity terms, and almost 40 percent of their population. And both countries are expected to post above average per capita growth rates – about 5.6 percent and 6.3 percent per year, respectively – over the 2017-22 period. Not surprisingly, we expect per capita growth in emerging Asia to be much stronger than in other regions – 5.4 percent compared to about one percent in Sub-Saharan Africa, the Middle East and North Africa, and Latin America and the Caribbean. An even starker difference emerges in expected income performance between fuel exporters and importers—with China and India classified in the latter. Average per capita income growth in fuel exporters since 1995 has been lower than importers, and is expected to diverge even further over the medium term. These projections reflect countries’ ongoing adjustments to persistently lower oil prices, but also reforms that are expected to yield dividends only in the medium and long term. 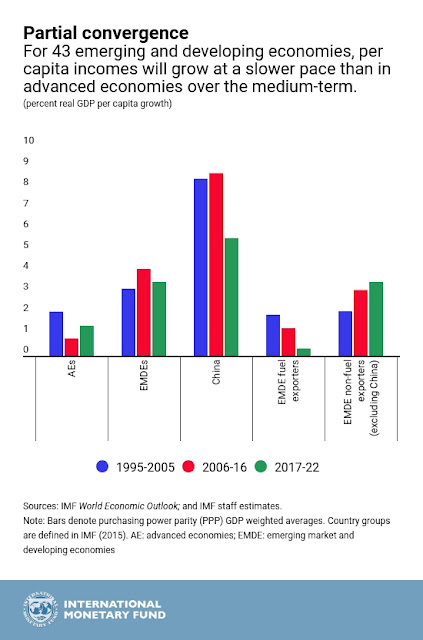 Overall, prospects for convergence are not as bright for many emerging and developing economies. More than a quarter of the countries in this group—43 countries (out of 151) representing 14 percent of the group’s population—are projected to diverge further from income levels in advanced economies. Of these economies, 18 are fuel exporters and 10 are “small states”—defined here as countries with less than half a million in population. The policy priorities to strengthen the pace of income convergence are naturally varied across countries. However, some apply to most of them. Among fuel exporters, adjusting to lower oil revenues while taking tangible steps to diversify exports and the sources of growth are key. Diversification is also an important goal for many small states. In a number of countries, better prospects will likely have to wait till domestic political tensions or geopolitical conflicts are resolved.